PCI ID is 1c00:3050. 1c00 is not a listed PCI vendor ID. 1C00 is the Vendor ID used by WCH (not assigned by pcisig). 3050 is the device ID when the chip is configured as a parallel port only. The other configurations are parallel port + 2 serial ports when the Dev. ID is 3250 or 2 serial ports (without a parallel port) when the Dev. ID 3253. A version of this card with the CH382L chipset exists, which does not function as a PARALLEL PORT. It is sold as one, looks like one. However, does not show up in Linux as a parallel device. The card functions as a serial translated parallel output. The problem here is that, AFAIK, only Dev. IDs 3250 and 3253 are present in the Linux kernel serial/parallel drivers and therefore Dev. 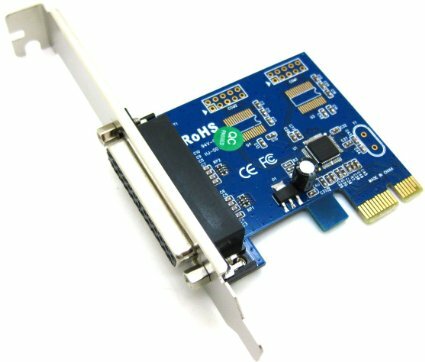 ID 3050 which is for the parallel port only configuration, isn't recognised and no driver is started. The manufacturer, WCH, provides Windows drivers and a DOS configuration application even allowing it to be used in the DOS 0x3BC/378/278 io port address ranges and selection of SPP or ECP/EPP modes. Device ID is set by zero-ohm links connected to pins 62 and 63 of the WCH382 chip - It may be possible to remove the link connected to pin 63 of the chip causing the card to identify as a serial/parallel combo card with Dev. ID 3250. As you can see from LSPCI output, the card is a SERIAL CONTROLLER and will not work as a parallel card.